The other day, I was idly flipping through YouTube’s offerings when suddenly it threw up Teen Batti Char Rasta on the side bar. I’d heard of the film but had never gotten around to watching it, Sandhya not being one of my favourites. (It seemed to be the bane of Shantaram’s films – that he inevitably cast his wife in the leading role.) However, Shantaram, like his contemporary Sohrab Modi, generally had something decent to say through his films. Because it starred Sandhya, I trawled the web to see what the film was all about, not wanting to waste my time on a film that starred her and wasn’t appealing, and came across Richard’s review of the film. (He and I generally agree to disagree on Sandhya.) It sounded interesting, and since I’d nothing better to do with my time (but didn’t want to waste it looking for another film to watch), I decided to give this a try. The film opens with the view of a house situated at the crossroads (the ‘char rasta’ of the title). The owner, a Lala Gulabchand (Diwan Sharar) is a Punjabi married to a woman from Benares (who, apparently, is not worthy of her character being named, nor the actress being credited). He has six sons, five of whom are married, each to a woman from a different region. The daughters-in-law are so protective of their backgrounds and culture that they insist not only on dressing in their traditional attire, but also on their meals being from their respective regional cuisines. Their mother-in-law is fed up with their attitudes (not to mention the six different meals that have to be made) and blames her husband for his cockamamie idea for national integration. However, the Lala is sure he’s on the right track. In fact, he says, he’s looking for a girl from a different background for his youngest son. Into this rather crazy household arrives Shyama (Sandhya), bringing in the requisite six regional newspapers. When they become aware that she can speak all six languages, the Lala hires her on the spot – they are in dire need of a maid who can understand all five daughters-in-law. Their previous maid ran away (Can’t say I blame her!) and the chef is near rebellion. Shyama’s bedridden father is none too happy at the idea of his young daughter staying in a house with many young men, not to mention he doesn’t approve of his educated daughter being a maid either. However, Shyama insists that they need the handsome salary that the Lala is offering, to pay for her father's medicines. The salary he's offering will add to the income that she otherwise earns as a part-time radio artiste. Having assuaged her father’s qualms, Shyama sets off with her belongings to her new abode. Along the way, she also (kindly) rejects her friend, the newspaper vendor’s proposal of marriage. Meanwhile, at the Lala’s house, the chef is at his wits’ end. With the maid absconding, he doesn’t know how he’s going to make six meals in time for lunch. Already, the various bahus are calling for their respective meals. While the Lala’s wife is excoriating her husband for the many meals that have to be made in this house because their daughters-in-law cannot see anything beyond their own culture, Shyama, nothing if not intrepid, manages to inject some order into the chaos. Into this chaos steps Ramesh (Karan Dewan), the youngest son. He’s idealistic, liberal and prone to romantic fantasies. Shyama soon discovers that he’s in love with his fantasy of her, or rather, with her alter-ego, Kokila, whom he imagines to be as beautiful as her voice is divine. She even tries to warn him that he might be in for a rude shock but Ramesh is wilfully deaf to her advice. The next weekend, it is Shyama who gets a shock – in a bid to meet ‘Kokila’, Ramesh arrives at the radio station where Shyama is recording a song. While she manages to escape through the back door, Ramesh catches Shyama at the entrance to the house – and is shocked to realise that Shyama was right after all: the young woman in front of his eyes bears no resemblance to the woman of his dreams. Poor Shyama. The next day, however, Ramesh – a decent sort – apologises to Shyama for hurting her feelings. As days pass, he realises that there’s more to the young woman who works cheerfully in his house than he first thought. The fantasy woman of his dreams is beginning to fade, replaced by the flesh and blood woman in front of his eyes. However, Shyama doesn’t initially think much of his change of heart. Even when her wayward heart skips a beat at his impassioned pleas, her pragmatic father gives her a sound piece of advice. One should only aim as high as one’s wallet and one’s courage allows. Shyama, too, is not prone to romantic day dreams, and steadfastly puts thoughts of Ramesh out of her mind. Ramesh, however, manages to convince Shyama that he loves her and wants to marry her. Life is looking up for the young girl who’s been castigated as the ugly duckling; personally, Ramesh’s sincerity convinces her that he indeed loves her, and professionally, she’s given the glad tidings that they are going to appoint her as a regular artiste. But the path of true love never runs smooth. Shyama comes up against an unknown rival – someone who will stop at nothing to ruin her. Even though Ramesh offers her concrete proof of his love for her, all hell breaks loose when he introduces her to the family as the new daughter-in-law to be. Humiliated and heart-broken, Shyama leaves the house. Even her father’s sage counsel cannot comfort her. Is the Lala’s experiment doomed to fail? His family, instead of becoming a symbol of national integration is splintering into sectarian regionalism. Can he save the day, or is he, as his wife scoffs, just an idealistic fool? There’s much to like in this socially progressive film, as dated as it is. Shyama's character, for one. It's heartening to see such a self-respecting character on screen. Shyama is the traditional young woman, alright, caring and nurturing, but she has a core of self-esteem that takes her lack of fairness/looks in her stride. In one of her initial scenes, when her stepmother scoffs at the idea of any man falling for the dark-skinned Shyama, the girl laughingly brushes her remarks off with a 'Main jaisi hoon waisi theek hoon.' It doesn't faze her, not even when Nandu, her friend who has a soft corner for her teases her about it. 'Toh tum kaunsa Krishn Kanhaiyya ho?' she retorts. Even when these comments sting (as it does when an admirer of her voicce remarks on her face being an impediment to her success), it is momentary. She is too confident to wallow in self-pity for long. I quite liked the fact that she can also give as good as she gets. When a character in the film, her social superior, excoriates her for her looks, her mien, Shyama stands up for herself. Not for her the limits of the menial position she occupies in the house - why, she'd much rather give up a lucrative job in order to maintain her self-respect. When Ramesh castigates her for having insulted a guest, she snaps that poor she may be, but her self-worth is equally important. It is that self-respect that causes Ramesh to look at her as a person. The father-daughter relationship in the film is also a plus. It is unusual for a film of that vintage to have a father who not only adores his daughter, but stands up for her in the manner that he does. From the first scene, where he tells his wife off for commenting on Shyama’s duskiness and supposed lack of beauty, to the fact that he’s educated her, brought her up not only to be independent but to have a sense of self-worth, the father is more than just a cipher, just there to provide a reason for the heroine to seek menial work. Even when he cautions her against falling in love with someone of a higher socio-economic stratum, it is not because he deems his daughter unworthy of such a relationship, but because he’s aware of the consequences that she will have to face in the aftermath. It is heartening to see their relationship play out. It is to him that she comes when in need of solace, and it is clear that their relationship is on an equal footing. She respects herself because he respects her. He has his hopes and dreams for her, but he doesn’t impose them on her – she makes her choices, and he supports them. The relationship between Ramesh and Shyama is also dealt with sensitively. Shyama is no shy violet, and that she has decided opinions is established in their very first meeting. Later, when she realises that she is his fantasy lover, cautions him against confusing his dreams and reality. And later, realising he’s hurt her, when Ramesh apologises, she listens, and accepts that apology. Ramesh, too, is not a dolt who assumes that because he has decided he loves her, she should – of course – love him in return. He pleads for a chance to show her that change of heart, and his sincerity is unmistakable. That she gives him that chance – after they talk – gives you an inkling of the kind of relationship they share. Later, he stands by her when circumstances erode her self-confidence. It is a very mature take on love and therefore, one gets the feeling that this couple will weather whatever the Fates see fit to throw at them. Director Shantaram also gets in some potshots at the propensity of the nationalists to throw the baby out with the bathwater – something that seems extremely relevant today. There isn’t much that I dislike about this film – no, not even Sandhya, though I did wonder what a very young Nutan would have done with this role. So also, Karan Dewan, who came off as a slightly wishy-washy character despite the depth and nuance the script had given his character. Oh, what I would have given to have, say, Dilip Kumar in the role, but that's just wistfulness. I did wish they hadn’t made a caricature of one of the characters, and that the daughters-in-law weren't ciphers, just a plot contrivance that did nothing to aid the narrative. Their introductory scenes were repetitive, though I assume they must have raised a laugh when the film first released. But these are just minor peeves in a film that has much to recommend it. 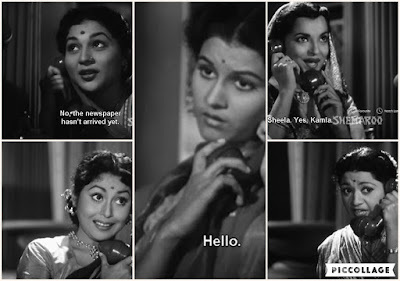 For the rest, given that ‘Kokila’ is a singer, there are some lovely songs (Shivram Krishna) rendered by Lata Mangeshkar. The highlight of the score, of course, is the multi-lingual song, sung by Lata Mangeshkar, Asha Bhosle, Zohrabai Ambalewali, and Balbir, and composed by different composers – Bengali/Kanu Ghosh, Tamil/Natraj, Sindhi/Gulshan Sufi and Ram Panjwani, Marathi/Vasant Desai with GD Madgulkar, Gujarati/Avinash Vyas, Hindi/Shivram Krishna and PL Santoshi and Punjabi/Shivram Krishna with lyrics by Feroz – even if it is somewhat shoehorned into the narrative.